Sen. Whitehouse identified four ways in which we live up to the Constitution, I am excerpting some of the best bits and breaking them into four separate posts for your contemplation this holiday weekend. The third way in which we live up to our Constitution, is by upholding our court system. Sen. Whitehouse points out that the right to a day in court is guaranteed to us by the Constitution. His concern is that this Constitutional right is under assault by corporate defendants. The Constitution mandates respect for the process that allows [injured plaintiffs] to stand up for their legal rights. Trial by jury is established in Article III, Section 2 of the Constitution, and by the Sixth and Seventh Amendments. The Constitution promises a “day in court,” however annoying that day might be to the corporate defendant. For years, business interests, operating through the Chamber of Commerce and other “law reform” outfits, have mounted a public relations campaign against the civil justice system. Their tale is that discovery costs, juries, and punitive damage awards are all out of control, allowing unscrupulous plaintiffs’ lawyers to hold corporations hostage and extort massive settlements in a litigation lottery that frustrates public policy. Their goal is to make corporate defendants seem the victims, justifying mandatory binding arbitration (often with systematically biased arbitrators), caps on damages, restrictive readings of statutes of limitations, and heightened pleading standards. How many times have you heard GOP talking points blaming the high cost of medical care on “trial lawyers”? How many times have you heard some winger shouting down the house about “tort reform”? Do you know what tort reform is? Pups, this is code for taking away your right to go to court if you are injured by a doctor’s malpractice, or a defective product, or the negligence or recklessness of another person or corporation. FAUX News’ pundits rant and rave about out of control jury awards, but they always manage to skip over the part where there would have been no award of damages UNLESS THE DEFENDANT WAS FOUND TO HAVE DONE SOMETHING WRONG. In the guise of trying to fix some of the unintended consequences of the class action lawsuit rules, Big Corpa would take away the right to redress which goes back before the Constitution, before the Magna Carta, all the way back to before there was an England, back when that island was composed of smaller Anglo-Saxon kingdoms and established the practice of weregeld. The term originates from the Middle English word “were” meaning “man” (think “werewolf”) and the Saxon word “geld”, “gilt” or “geldt” meaning “money”. The concept was also used throughout the Scandinavian world and the Germanic world from at least the end of the Roman Empire. This has been a fundamental human right for millennia. We live in a world where corporations are allowed (ahem) free speech rights in the form of large campaign contributions and soft money advertising campaigns, even if the views expressed are directly contrary to the views of their shareholders. Sen. Whitehouse rightly points out that the only branch of government where an ordinary citizen has any hope of making their plea in front of a decision maker who is not bought and paid for with campaign contributions, is before the jury box. Corporations would be only too happy with a world in which their every contact with government officials – Presidents, governors, federal and state senators and representatives – every contact is with individuals and institutions who have been rendered supple to their interests by the emollient effect of corporate contributions. Against this lubriciously accommodating world stand the hard square corners of the jury box, filled with ordinary Americans, whose views you tamper with only at your legal peril, and before whom the mightiest corporation stands equal with its most humble and voiceless victim; where each party has equal opportunity to put its case to a group of our peers; where the status quo can be disrupted; where the comfortable can be afflicted and the afflicted find some comfort, all under the shelter of the law. We stand up for the Constitution when we stand up for our courts. 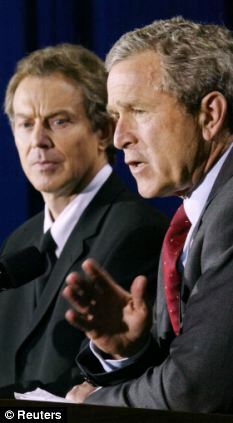 By the time Tony Blair led Britain to attack Iraq, he had stopped believing his own lurid claims about Saddam Hussein’s weapons of mass destruction, according to an unpublished interview with the late Robin Cook, the former Leader of the Commons who resigned from the Cabinet just before the invasion in March 2003. In the interview, which Cook gave me in 2004, the year before his death, he described Blair’s actions as ‘a scandalous manipulation of the British constitution’, adding that if the then Prime Minister had revealed his doubts, they would have rendered the war illegal. To read more, click on link and scroll down to bottom of article, Iraq Inquiry bombshell. The Chilcot Inquiry into the war will interrogate the former Prime Minister over the devastating ‘smoking gun’ memo, which warned him the war was illegal. The MoS can disclose that Attorney General Lord Goldsmith wrote to Mr Blair in July 2002 telling him that deposing Saddam Hussein was a breach of international law. An explosive secret letter that exposes how Tony Blair lied over the legality of the Iraq War can be revealed. The Chilcot Inquiry into the war will interrogate the former Prime Minister over the devastating ‘smoking gun’ memo, which warned him in the starkest terms the war was illegal. The Mail on Sunday can disclose that Attorney General Lord Goldsmith wrote the letter to Mr Blair in July 2002 – a full eight months before the war – telling him that deposing Saddam Hussein was a blatant breach of international law. It was intended to make Mr Blair call off the invasion, but he ignored it. Instead, a panicking Mr Blair issued instructions to gag Lord Goldsmith, banned him from attending Cabinet meetings and ordered a cover-up to stop the public finding out. Lord Goldsmith was so furious at his treatment he threatened to resign – and lost three stone as Mr Blair and his cronies bullied him into backing down. Sources close to the peer say he was ‘more or less pinned to the wall’ in a Downing Street showdown with two of Mr Blair’s most loyal aides, Lord Falconer and Baroness Morgan. The revelations follow a series of testimonies by key figures at the Chilcot Inquiry who have questioned Mr Blair’s judgment and honesty, and the legality of the war. The Mail on Sunday has learned that the inquiry has been given Lord Goldsmith’s explosive letter, and that Mr Blair and the peer are likely to be interrogated about it when they give evidence in the New Year.